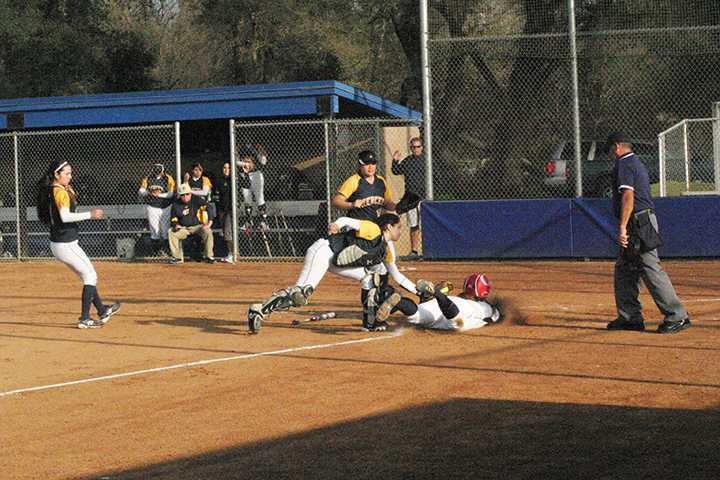 American River College’s softball team shut out Merced College 8-0 on Thursday, with two innings to spare. The game was called on the eight-run rule when the score reached 8-0 in the bottom of the fifth, as left-fielder Darian Garnett doubled to bring in the run. The win finished off a 2-0 doubleheader matchup against Merced, who came into the game with a record of 2-6, but winners of its last two games. Infielder and catcher Jennifer Woo went 3-3 with 3 RBIs, a double, and one run scored, and starting pitcher Lolli Conway struck out two batters while giving up just three singles and three walks over the five innings. Woo came into the day’s games against Merced with a team-high .444 batting average at the plate and an .833 slugging percentage, hitting four doubles and the team’s only home run. ARC’s defense helped Conway shut out Merced, as shortstop Cynthia Van Bogart turned two timely double-plays to prevent runs in the first and third innings. Conway came into the doubleheader with a 5.02 ERA over 15.1 innings pitched and 12 strikeouts. She also batted 1-3 in the game with a two-RBI single. Head coach Lisa Delgado was enthusiastic about the team’s progress after a 2-3 start. “It’s pretty exciting to see. We’re making those small adjustments right now at the plate and defensively we’re getting better. Pitchers are doing better hitting their spots,” said Delgado. In the first game of the doubleheader, ARC won 17-3. Both wins move the team’s record to 5-3, with eight games left before conference play begins. “I was really pleased with both pitchers. It was nice to see everybody hitting 1-9,” said Delgado of the day’s games. Be the first to comment on "ARC softball swept Merced College in a doubleheader Thursday, finishing the second game earlier than expected."